Chapter 2 The Therapeutic Relationship. Chapter 3 An Integrative Approach to Developmental Psychopathology. Chapter 5 Psychiatry and the Neurosciences. UNIT 2 THE CONTEXT OF CARE. Chapter 6 Care Settings and the Continuum of Care. Chapter 7 Cultural Context of Care. Chapter 8 The Multidisciplinary Treatment Team and Working with Other Professionals. 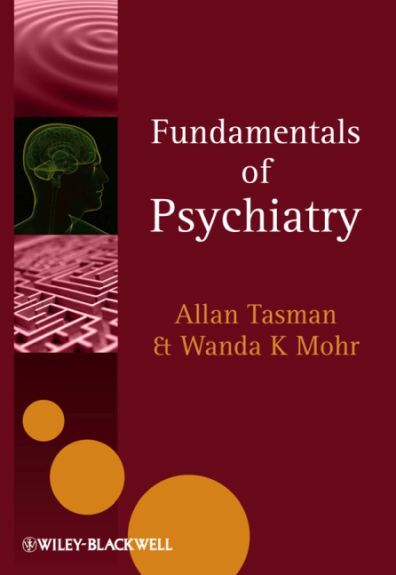 Chapter 10 Legal Context of Psychiatric Practice. Chapter 13 Bipolar Mood Disorders. Chapter 18 Substance Use, Abuse, and Dependence. Chapter 20 Stereotyped Movement Disorder and Reactive Attachment Disorder. Chapter 22 Impulse Control Disorders. Chapter 23 Mental Disorders due to a Medical Condition. Chapter 25 Schizophrenia and Psychoses. Chapter 28 Psychological Factors Affecting a Medical Condition. UNIT 4 ASSESSMENT AND THERAPEUTICS. Chapter 30 Psychiatric Assessment, Treatment Planning, and the Medical Record. Chapter 31 Psychological Testing and Rating Scales. Chapter 34 Antidepressants and Mood Stabilizers. Chapter 36 Anxiolytics, Stimulants, and Cognitive Enhancers. Allan Tasman is Past President of the American Psychiatric Association and immediate Past-President of the Pacific Rim College of Psychiatrists. He is a world-renowned psychiatric leader and educator and is Secretary for Education of the World Psychiatric Association, responsible for all of the association’s worldwide education programmes and initiatives. He has great experience in writing textbooks, numerous journal articles, book chapters, reports, and articles for the popular press. Wanda K. Mohr is a certified clinical nurse specialist in child/adolescent psychiatric nursing, and a Fellow in the American Academy of Nursing. She holds a masters degree in behavioral sciences and a PhD in psychiatric nursing. She has almost 40 years of practice and teaching psychiatric nursing. In addition to the breadth and depth of clinical and academic expertise, she is a professor in a major University School of Nursing and an adjunct clinical associate professor of child psychiatry at the Robert Wood Johnson Medical School.